Would you like to earn some extra cash? Are you willing to invest in your adipose fat deposits? Would you consider becoming an adult stem cell producer for the DSCT? 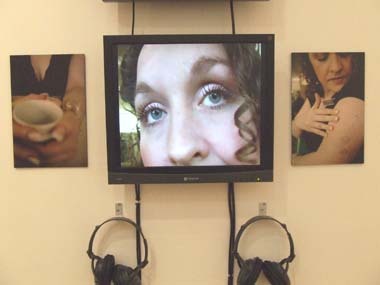 These and similar questions were posed to visitors to the RCA Interim Show as part of the live performance of Stem (pictured above). 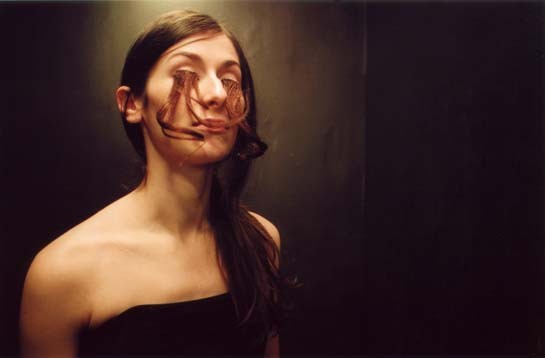 As an accompaniment to a video and image scenario, the live performance transcended the project into the reality of the show and the personal choice of the viewer. Gemma Layton, the brilliant actor portraying the brassy Beth Hammond, recruiter of stem cell producers for the Dept. of Stem Cell Technology (DSCT), inadvertently asked viewers to question what personal circumstances they would need to experience to become a body farm for economic survival. The flesh and blood presence of Beth as shown in the video work, scars/warts ‘n’ all, within the exhibition space brought a painful reminder of the real choices (or lack of choice) many people face to scrape-by. As I hoped, the adaption of the video into a live performance piece created a level of scenario believability unachievable by the static exhibition context. The reaction to our roaming recruitment interviews for the DSCT, offered a very real engagement with the work and gave me the chance to hear people’s reactions to the project and subject matter. The outcome of the live performance will be featuring in the future developments of Stem. Notes for the future: is the hubbub of the opening night the best time to stage such an event? What follow-ups could be developed? How can the recorded interviews on the night feed into the next stage of the project? How can a buzz be created around a project by live performance? Tuesday evening (23.01.07) marked the opening of the Design Interactions ‘Work in Progress’ show at the Royal College of Art. My project ‘Future Farm’ in the group show was a first outing for the project in the public realm, as an exhibition piece. This blog will be highlighting the continuing development and the many edifices of this umbrella project. It will present research, sources, musings and curious adventures into the near and far future of the human body farm. This first entry on ‘slub’ highlights my starting points with two projects – Nanotopia and Stem. Future Farm reflects the desperate reality of severely deprived people who reconsider their body as a last resort. The current trade in organs, eggs, sperm and hair informs this future scenario. Combined with the impact of bio and nanotechnology, this leads us to a possible future where the body is used as a farm to cultivate clinical and pharmaceutical products. In Nanotopia (above), synthetic biology is used to manipulate warts (self-replicating Human Papilloma Viruses) to grow desirable products on the body. In comparison, at the upper extremity of the socio-economic scale, the impact of the ‘body farms’ spur new bodily aesthetics. This tends towards growth-free bodies and natural protection systems against free viruses in the environment. Stem (above) presents a legalised trade in stem cell production from adipose fat tissue. Extrapolating from current scientific research, the scenario explores the future relationships between producers and the medical industry. Consequently Stem questions the Rich and Poor’s increasing polarisation and their extremes of body morphology in response to a market economy.